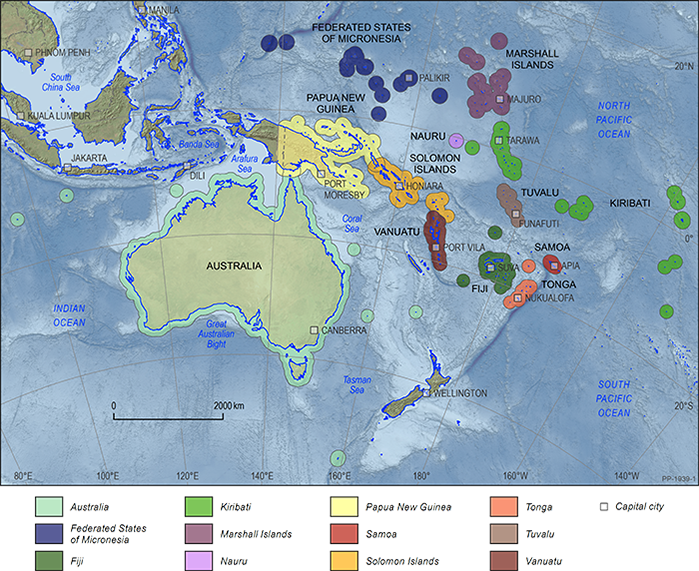 Operating under the Climate and Oceans Support Program in the Pacific (COSPPac), the Pacific Sea Level and Geodetic Monitoring (PSLGM) project is working towards generating an accurate record of the sea level across the region. The project is focused on determining the long term variation in sea level through observation and analysis of changes in the height of the land (using Global Navigation Satellite System (GNSS) data) and changes in the sea level (using tide gauges managed and operated by the Bureau of Meteorology (BOM). 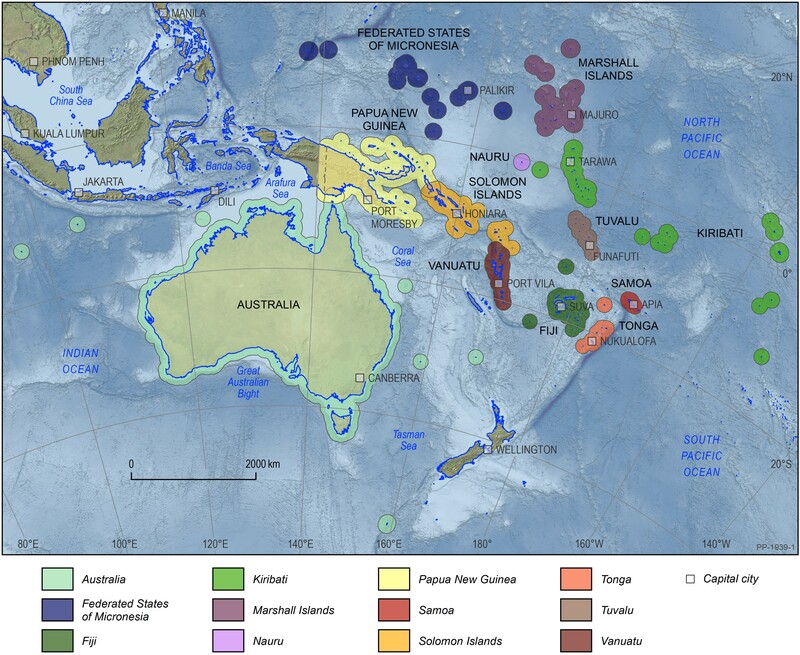 The continuation of a successful 20-year Australian Aid funded sea and land level monitoring program involves 14 Pacific Island nations (Figure 1) and will support countries to adapt to, and mitigate, the impacts of climate variability. Geoscience Australia provides COSPPac information about absolute land movement by using geodetic instruments to precisely measure the absolute movement of the land over time. Land movement caused by earthquakes, subsidence and surface uplift have an important effect on sea level observations at tide gauges. For example, a tide gauge connected to a pier which is subsiding at a rate of 5 mm per year would be observed as a rate of 5 mm per year of sea level rise at the tide gauge. Because of this, it is important to measure, and account for, the movement of land when measuring ‘absolute’ sea level variation - the change in the sea level relative to the centre of the Earth. Relative sea level variation on the other hand is measured relative to local buildings and land mass around the coastline. Geoscience Australia’s work enables more accurate 'absolute' sea level estimates by providing observations of land motion which can be accounted for by the Bureau of Meteorology when analysing the tide gauge data. In most cases, three types of measurement are necessary to assess whether absolute sea level is changing at a given point: tide gauge data, GNSS data and levelling observations. Tide gauges measure relative sea level variation, i.e. how sea level changes relative to a tide gauge attached to a rock wall or wharf. It is important to note a tide gauge cannot differentiate between changes in the sea level and movement of the tide gauge if the land it is attached to moves. GNSS can be used to measure the vertical crustal motion of the Earth with respect to the centre of the Earth. It is a useful technique to distinguish relative sea level rise from absolute sea level rise. 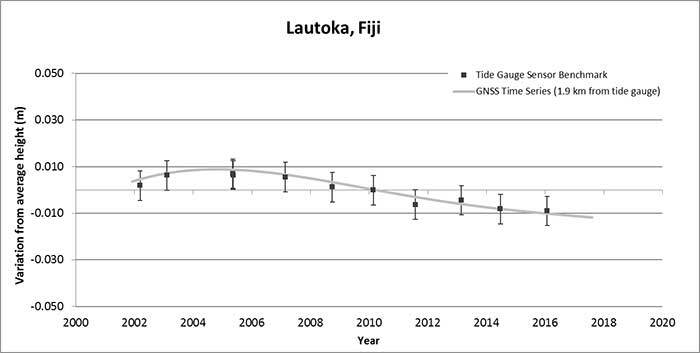 For example, in the case of the tide gauge subsiding, if the land subsidence has been observed by GNSS on the tide gauge, this trend can be removed from the relative sea level variation and an estimate of absolute sea level change can be derived. In situations where a GNSS station is not attached directly to the tide gauge, in order to distinguish sea level variation from vertical crustal movement, it is necessary to regularly measure the height difference between the GNSS station and the tide gauge. 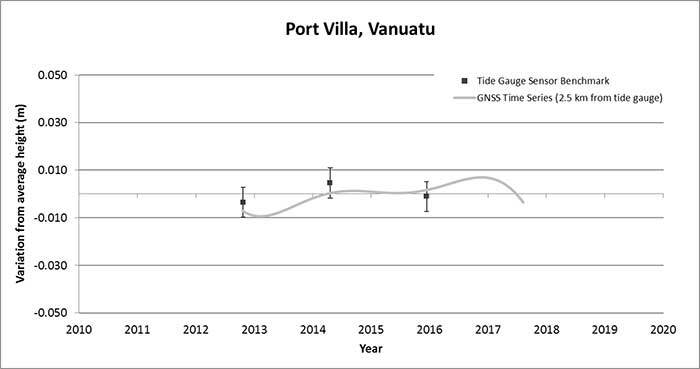 As part of the PSLGM Project, the difference in height between the GNSS station and tide gauge sensor benchmark is measured by levelling between them every 18 months (Figure 2). by staff from the Pacific Community (previously the Secretariat of the Pacific Community). The difference in height is added to the GNSS ellipsoidal height at the time of the levelling survey to compute the ellipsoidal height of the tide gauge sensor benchmark. The results below provide the ellipsoidal height of the tide gauge sensor benchmark (black squares) on the dates that levelling surveys were undertaken. Superimposed is the GNSS time series (grey). 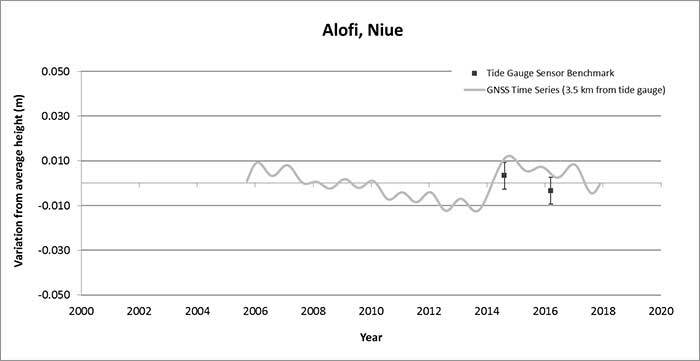 This has been done to show that in the majority of cases the change in height of the tide gauge is directly correlated to the movement of the GNSS station (implying the land mass under both the GNSS site and tide gauges are moving at almost the same rate). This is not true for all sites (e.g. Tonga), where they are not aligned. In these cases, localised movement at the tide gauge site may be the cause (e.g. 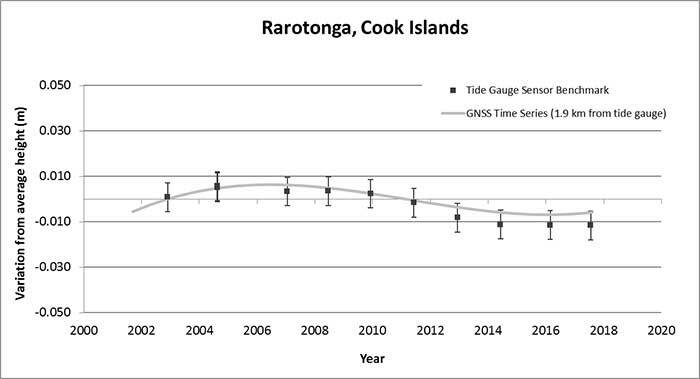 the Tonga tide gauge has been hit by boats and its position has moved). NOTE: The vertical scale of the plots have been altered to show variability of the ellipsoidal height from the mean tide gauge sensor benchmark ellipsoidal height. The uncertainty of the ellipsoidal heights on the tide gauge sensor benchmark is a combined uncertainty of the GNSS and levelling data. For further information please contact geodesy@ga.gov.au.